BRE, the independent research, knowledge and advice organisation for the built environment sector and beyond, is the lead research and innovation partner for this year’s Ecobuild2015. Key figures from within BRE including Paul Littlefair, BRE’s Principal Lighting Consultant and Jonny Williams, Director BRE National Solar Centre and BRE South West, will attend the world’s largest event for sustainable design, construction and the built environment, which takes place at London ExCel from 3-5 March 2015. During the three day event, the 2015 winners of the BREEAM Awards will be announced. Also attending will be Rufus Logan BRE Director for Scotland who will be on hand to share recent experiences with delegates. Notable amongst these was Rufus’ recent visit to China when BRE was appointed by Hongsheng Construction & Investment Group Co. Ltd as Chief Sustainability Advisor on a pioneering project to develop a major construction industry zone in ShangRao, China, a major conurbation located in the Jiangxi province which, with the opening later this year of the high speed rail-link, will be just 100 minutes from Shanghai. 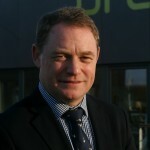 Closer to home, colleague Dr David Kelly, Group Director BRE Innovation Park Networks will also attend EcoBuild. David oversees the global development of BRE’s Innovation Parks and the monitoring of demonstration projects on the BRE Innovation Park @ Ravenscraig. The Scottish Park is a mini-demonstration community of homes and buildings on the former steel works site that is tapping into the UK’s legacy of world changing invention and innovation. Indeed both were on hand to meet Scottish Government Cabinet Secretary for Training, Youth and Women’s Employment Angela Constance, when she unveiled two of the latest projects at the Park. Throughout EcoBuild, senior representatives from BRE will be available to meet delegates in the North Arena on stand N4120/N5214.